Cytoskeletal extract of chicken gizzard. Our Abpromise guarantee covers the use of ab8969 in the following tested applications. Structural protein of the cytoskeleton. Smooth muscle; contractile or vascular (for the long form). Belongs to the smoothelin family. Contains 1 CH (calponin-homology) domain. Cytoplasm > cytoskeleton. Exhibits a filamentous organization. Immunohistochemical analysis on paraffin section of human smooth muscle labeling Smoothelin with ab8969. 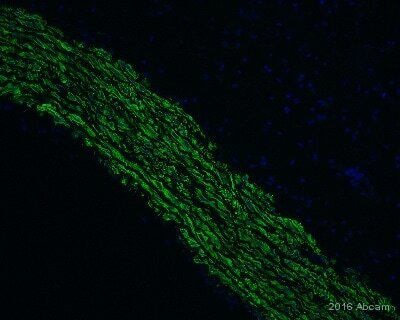 Human blood vessel in cardiac muscle stained with the monoclonal smoothelin antibody ab8969. Immunohistochemical analysis on frozen section of chicken gizzard striated muscle labeling Smoothelin with ab8969. ab8969 staining cells from a human vascular smooth muscle cells by ICC/IF. Cells were PFA fixed and permeabilized in 0.5% Triton X-100 prior to blocking in 10% serum for 10 minutes at 21°C. The primary antibody was diluted 1/100 and incubated with the sample for 1 hour at 21°C. 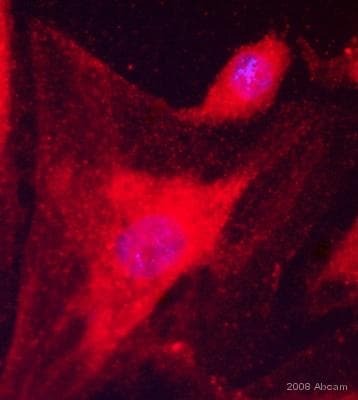 An Rhodamine conjugated donkey anti-mouse antibody, diluted 1/200, was used as the secondary. Immunohistochemistry on frozen section of chicken gizzard striated muscle labeling Smoothelin with ab8969. Publishing research using ab8969? Please let us know so that we can cite the reference in this datasheet. Thank you for your enquiry and your interest in our products. We would like to ask you please to provide some more information about your IHC staining and fill in this specific IHC Questionnaire. Your answer will help us identify the source of the problem and give you sufficient technical support. 1. Order details: •	Batch number: •	Abcam order or Purchase order number: •	Antibody storage conditions (temperature/reconstitution etc) 2. Please describe the problem (high background, no staining etc). 3. On what material are you testing the antibody in IHC •	Species: •	Cell Iine or tissue: 4. How did you fix the samples? •	Ethanol, methanol: (was it ice cold) •	Acetone: (was it ice cold) •	Paraformaldehyde (percentage, perfusion fixed on not): •	Fixation time: •	Fixation temperature: 5. For formalin-fixed paraffin embedded tissue: did you apply antigen retrieval step? •	Enzymatic method: •	Heat mediated technique: •	Other : 6. Blocking steps: •	For HRP detection method: did you block endogenous peroxidases: •	How did you block the unspecific binding sites: serum, BSA, Milk, other •	For how long: 7. Primary antibody •	Specification (in which species was it raised against): •	At what dilution(s) have you tested this antibody: •	What dilution buffer was used: •	Incubation time: •	Incubation temperature: •	What washing steps were done: 8. Secondary antibody •	Specification (in which species was it raised against): •	What dilution buffer was used: •	Incubation time: •	Incubation temperature: •	What washing steps were done: •	Do you know whether the problems you are experiencing come from the secondary? 9. What detection method are you using? 10. Background staining •	Please provide an image of your staining 11. Which detection system did you use? 12. Did you apply positive and negative controls along with the samples? Please specify. 13. Optimization attempts •	How many times have you tried the IHC? •	Do you obtain the same results every time? •	What steps have you altered? We look forward to hearing from you soon. Can you tell me the concentration of this ab or reccommendations for dilutions to use for immunohistochemistry? Ab8969 is in an unpurified form (tissue culture supernatant) and we cannot guarantee the concentrations for unpurified material. When we know what the recommended dilutions are for an antibody we will state them on the datasheet, otherwise the dilutions are assay dependent.